tools used. Truth is not just any hose nozzle will do. Upgraded to meet ALL watering & washing needs, this sprayer wand is our bestseller! All you have to do is turn the built-in dial to adjust the flow of water. It makes watering your yard a breeze. Modern convenience at its finest!  HIGHLY DURABLE CONSTRUCTION - Rust-proof, Leak-proof, Corrosion-Resistant - Dependability You Can Trust - No Better Choice! Fitted with a handle made out of super strength ABS & TPR materials, our hose attachment sprayer never leaks, corrodes, weakens or cracks. It's time to up your growing game. This heavy duty water nozzle is a multi-functional gardening tool that does it all. Why wait? Don't delay. 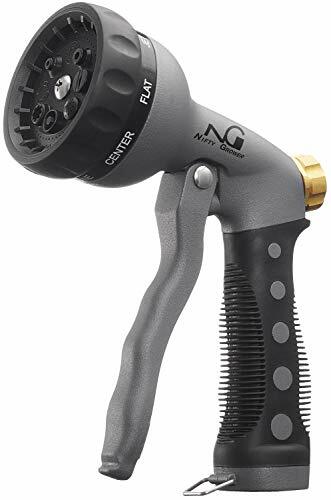 Click 'ADD TO CART' to order your multi-way Nifty Grower Garden Hose Nozzle Wand! 8 SPRAY SETTINGS FOR ALL PURPOSE USES: Our new 2018 edition sprayer nozzles offer 8 different spraying water patterns for convenience. Easily switch between a Flat, Shower, Center, Mist, Rinse, Cone, Jet & Soaker setting as so needed. #1 CHOICE FOR GARDENING, LANSCAPING: Designed to never lose pressure & equipped with a pre-installed quick connector, this garden hose attachment is the preferred choice among avid gardening enthusiasts, lawn care specialists & landscapers. BEST FOR WASHING CARS, PETS & SIDING: Use as a pressure washer nozzle for outdoor cleaning, a sprayer for weed killer or insecticide, a cat or dog washing sprayer or as a nozzle sprayer for car washes. It's the ultimate multipurpose hose nozzle! ERGONOMIC HANDLE WITH NON-SLIP GRIP: Shockproof & slip-proof, the handle featured in the design of our bestselling spray nozzle for garden hose fits securely in hand to prevent slipping, sliding & discomfort. No more sore/painful hands. THOUGHTFUL GIFT IDEA FOR GARDENERS: Gardeners & nursery owners swear by our 8 way power wand nozzle. A garden essential for gardening moms, dads, wives, friends or neighbors, our sprayer attachment for garden hose makes a great gift.